These traitors trace their ancestry from India. Yet due to freedom of speech permitted at their present country, they fervently show their hatred for India at such parades that are supposed to showcase their culture & tradition than highlight their dubious political goals. 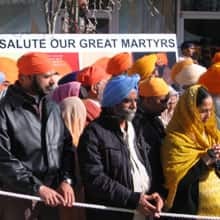 Glorifying the martyrs (as per them) who died fighting for the Sikh cause. These include the eunuchs who killed our former prime minister, the militants who killed retired general Arun. S. Vaidya & even the Air India Kanishka bombing accused. The indifferent & mute Canadian government would soon pay their price for letting these leeches flourish on their soil. Top Canadian leaders stayed away from a controversial Baisakhi parade, which displayed pictures of Sikh militants in the city of Surrey near here. Over 100,000 attended the parade, which is the largest such event by the Indo-Canadian community in the country. The organisers had put up an exhibition of pictures of 'shaheeds' (martyrs) on the temple premises. On top of the entrance gate to the exhibition was written in bold letters: 'Story of Sikh Genocide in India'. Among those whose photos were displayed were Satwant Singh and Beant Singh, the two assassins of former Indian prime minister Indira Gandhi, Sukha and Jinda, the killers of former Indian army chief General A.S. Vaidya, who is blamed for ordering the 1984 army action at the Golden Temple in Amrtisar to flush out militants, and leaders of the banned Babbar Khalsa and the International Sikh Youth Federation. Under the headline 'And those who betrayed the cause of the Sikh nation' were displayed pictures of Indira Gandhi, late president Giani Zail Singh, former home minister Buta Singh, late Punjab chief minister Beant Singh, and late Sant Harchand Singh Longowal, former Akali Dal president who had signed the Punjab peace accord with Rajiv Gandhi. Also included under this headline was the top leadership of the Akali Dal, including Parkash Singh Badal, his son Sukhbir and Tamil Nadu governor and former Akali Dal leader Surjit Singh Barnala. The pictures of the mutilated bodies of young Sikhs allegedly killed in staged state killings were also displayed. Since their presence at last year's parade, which carried floats depicting militant Sikh leaders such as Air India plot mastermind Talwinder Singh Parmar, later became an embarrassment for them, most political leaders decided to stay away. British Columbian premier Gordon Campbell left for Vancouver Island. Attorney-general Wally Oppal, who is the topmost Indo-Canadian in the provincial government, too didn't show up. Opposition leader Carole James too was absent as was Indo-Canadian MP Neena Grewal. However, former Canadian revenue minister Herb Dhaliwal was present at the main stage at the Sikh temple, as were some other Indo-Canadian leaders, including MP Sukh Dhaliwal, former British Columbia minister Moe Sihota, and Jagrup Brar and Harry Bains, both MLAs. 'Everybody has a right to speech as long as it does not promote violence. So I have no problem in coming here,' Brar told IANS. Surrey city mayor Diane Watts walked with the parade under heavy security, but stayed away from the parade organisers. The mayor and the city authorities had counselled the radical Sikh temple against displaying such floats as it condoned acts of violence. Surrey is home to the largest concentration of Indo-Canadians, mostly Punjabis, anywhere outside of India. During the militancy in Punjab, it had become the hotbed of separatist pro-Khalistan elements. Could you shed some light on this "truth"? It was Bhindranwale who influenced & stirred up Sikh nationalism & the creation of Khalistan then. Indira had him eliminated with Operation Blue star. I don’t believe prior to him getting popular, there was any Sikh separatist movement then. As for Sikhs, I respect them & personally have many sardar friends. Sikhs are hardworking, enterprising & patriotic. But its disgusting to see the above news wherein villains are worshipped as heroes & martyrs. Killing an unarmed & unsuspecting lady by someone whom she trusted the most doesn’t make the killers heroes. Gunning down an unarmed & retired general before his own family doesn’t make the murderers heroes. Clandestinely placing a bomb within an aircraft & blowing up innocents over the Atlantic doesn’t equate the perpetrators to heroes. These so called martyrs were nothing but cowards & the above diaspora revering such idiots as martyrs is truly despicable. Traitors indeed. Last edited by Cooldude; April 14th, 2008 at 10:51 AM. Har sardar ke ghar me Bhindranwale ki king size photo lagi hai aur bhaut sare Gurudware me bhi. unake paas Bhagat singh ki photo nahi milegi par Bhindranwale ki jaroor mil jayegi. I don't know wht the heck Indian embassy is doing here, no objection? Here most of sardar openly justify Kanishka blow up and Indira gandhi killing. Pata nahi govt of india aur Canada govt kuch karti kyu nahi hai. another thing is most of the sardar here, are very rich businessman so they have strong funding and Here Gurudwara is doing the same job like "Madarasa". Thanks god it was Indira that time otherwise punjab would be in the same situation like Kashmir till now. Last edited by chadhakya; April 14th, 2008 at 02:58 PM. Dhuru, what unsuspecting killed innocents are you talking about? It was only after Operation Blue Star that militancy rose in Punjab, that was eventually quelled over the years. Prior to that, what en masse killing are you referring to? Be it whatever, Indira was justified then to send the army to the Golden temple & flush out the militants inside.